Radon is an odorless, colorless, and tasteless radioactive gas. It is a decay product in the chain of decay products of uranium. Radon is present to some degree in almost all rock, soil, and water. Because the air pressure outside your home is significantly higher than within, a vacuum-like effect draws radon gas in through cracks and pores in the foundation. 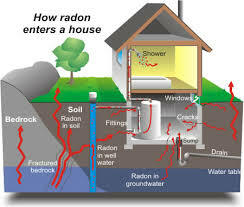 Radon entering the home through well-water can also contribute to radon levels within the home. Numerous studies have found that the radioactive particles of radon become trapped in your lungs when inhaled and/or ingested. Over time, your lung tissues become damaged thus increasing the carcinogenic effects associated with elevated levels of radon. The Environmental Protection Agency and the Surgeon General represent that radon is the second leading cause of lung cancer. It is estimated that radon causes about 21,000 deaths per year in the United States. For levels that fall at or above 4pCi/L, installation of a radon mitigation system by a qualified professional is recommended. Companies that offer remediation and mitigation services must also employ an individual who is nationally certified in radon mitigation. Through effective remediation techniques, even homes remarkably exceeding the “recommended action level” can successfully be reduced to below 4pCi/L. Because no level of radon gas is technically considered safe, corrective actions can also be employed to improve levels between 2pCi/L and 4pCi/L . For levels within this range, improvements such as sealing cracks in the basement slab and foundation walls as well as covering sump pits, etc. may be considered. These types of improvements for lowering radon levels should be explored; however, it is not the “recommended action level” for installing a mitigation system. A list of qualified radon mitigation companies can be found here.